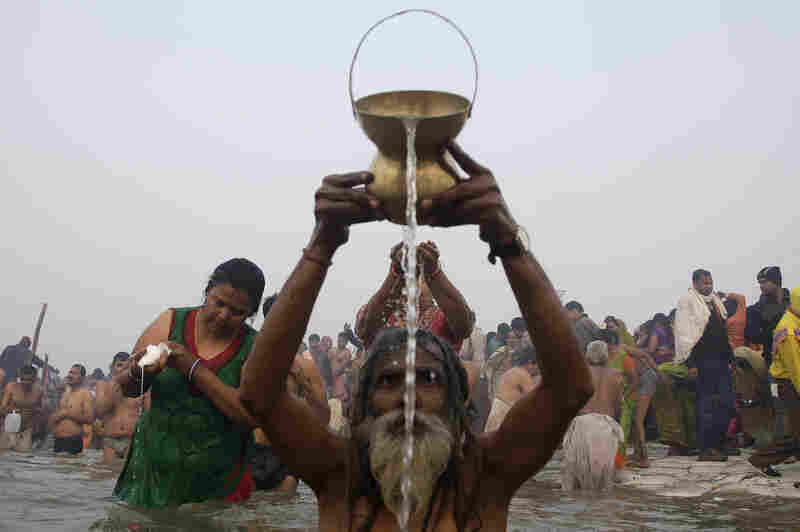 'Biggest Gathering On Earth' Begins In India; Kumbh Mela May Draw 100 Million : The Two-Way The festival, which happens every 12 years, draws pilgrims to the confluence of the Ganges and Yamuna rivers. On Monday alone, as many as 10 million were expected to bathe in the waters. 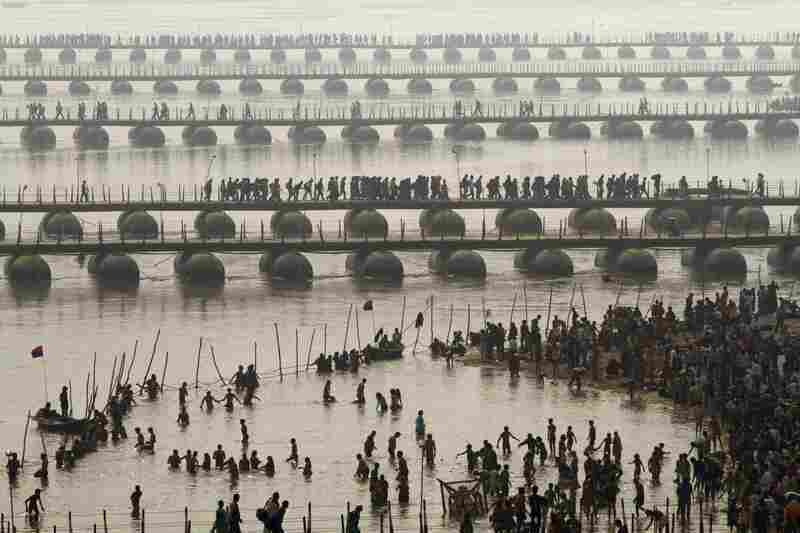 Hindu devotees pray at the Sangam, or confluence, of the Yamuna and Ganges rivers during the Kumbh Mela festival in Allahabad, India, on Monday. 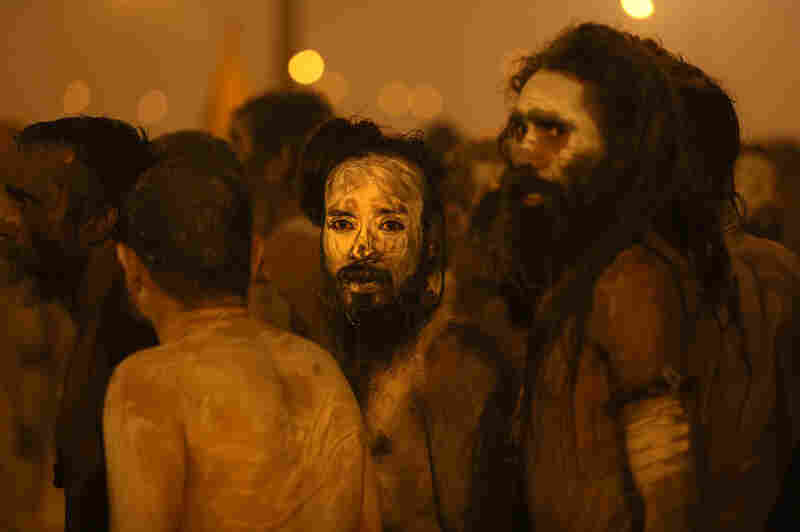 Hundreds of thousands of Hindu pilgrims led by naked, ash-covered holy men stream into the sacred waters Monday at the start of the world's biggest religious festival. Devotees pray and wash as they attend the first Shahi Snan, or grand bath. 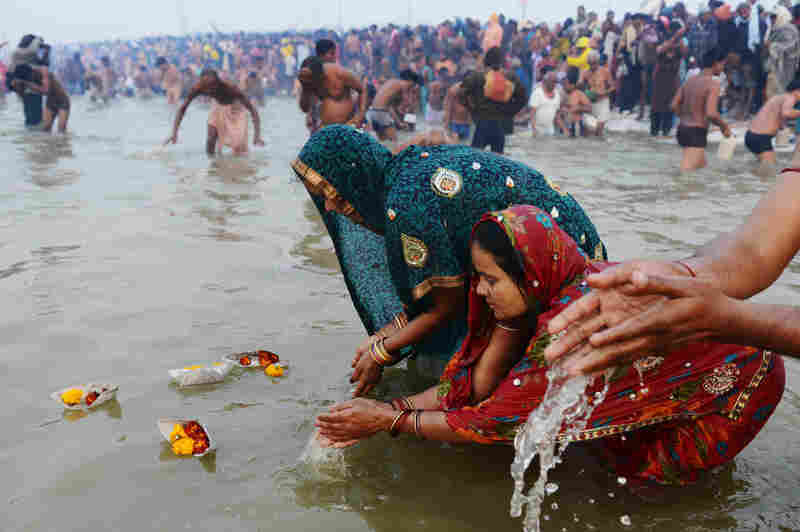 Up to 100 million worshippers will gather at the Kumbh Mela over the next 55 days to take a ritual bath in the holy waters, believed to cleanse sins and bestow blessings. Pilgrims release offerings in the river's current while bathing. 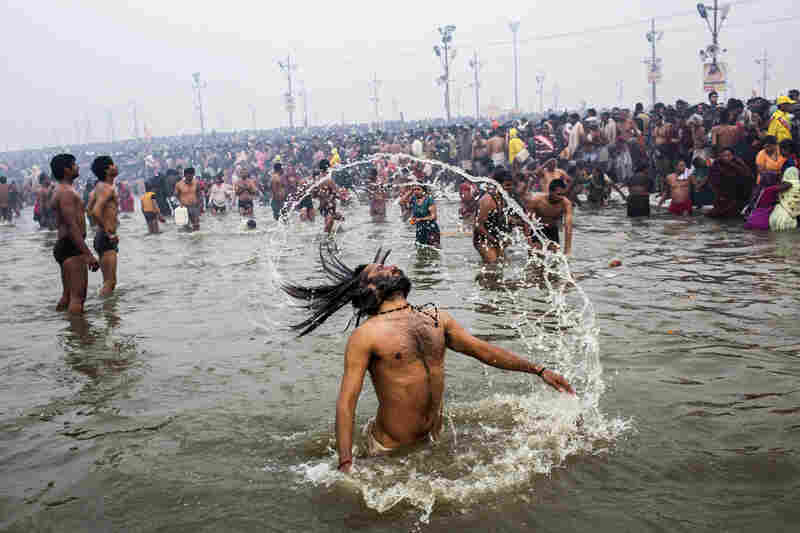 A Hindu holy man, or Naga Sadhu, swings his hair during the royal bath on Makar Sankranti. Naga Sadhus celebrate naked in the water at Sangam. Naga Sadhus return after a dip in the holy waters. Imagine one-third of the entire U.S. population — 100 million or so people — visiting Dallas in the next 55 days. That gives you a sense of what began today in Allahabad, India, a northern city of about 1.1 million people. Over about the next eight weeks it is expected to host nearly 100 times its population in pilgrims (not all at once, obviously). They're coming for the Hindu festival of Kumbh Mela, which happens every 12 years. Today alone, the BBC reports, at least 10 million pilgrims were expected to come to bathe "at the confluence of the Ganges and Yamuna rivers." That's about five times more people than attend Mecca's annual six-day hajj for Muslims. The Times of India says that the nectar promises immortality. By 8 a.m. local time today, the newspaper adds, police estimated that 1.5 million people had already gathered "with more on their way." "More than 2,000 years old, the festival is a meeting point for the Hindu sadhus, some who live in forests or Himalayan caves, and who belong to dozens of inter-related congregations. The sects have their own administration and elect leaders, but are also known for violent clashes with each other. "Some naked, some wrapped in saffron or leopard-print cloth and smoking cannabis pipes, the holy men hold court by fire pits in sprawling camps decorated with coloured neon lights, where they are visited by pilgrims who proffer alms and get blessings." According to the BBC, "14 temporary hospitals have been set up with 243 doctors deployed round-the-clock, and more than 40,000 toilets have been built for the pilgrims. Police checkpoints have been set up on all roads leading to Allahabad and about 30,000 policemen and security officials have been deployed to provide security during the festival."